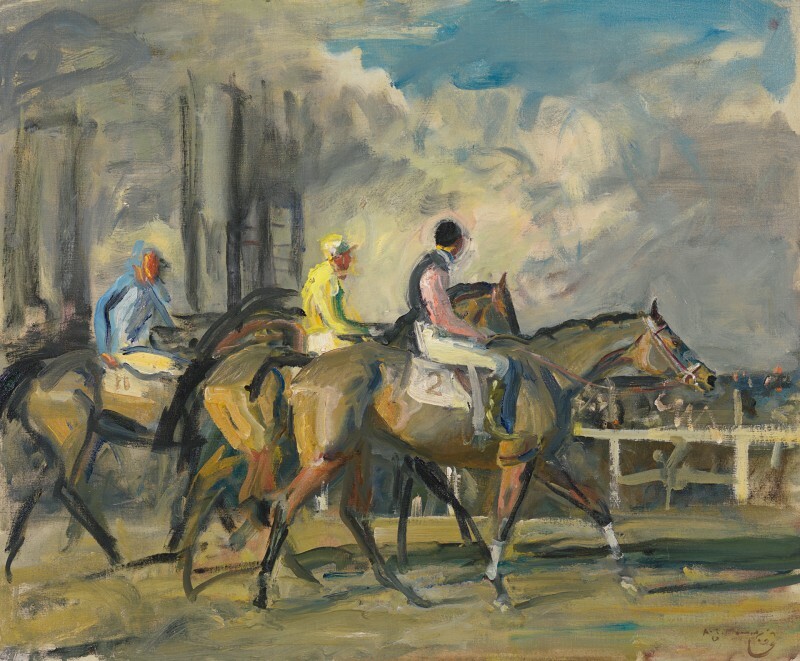 Alfred Munnings returned to the theme of racing when the sport revived after the Second World War, painting large-scale Starts and views of horses on the gallops. He showed a monumental After the race at the Royal Academy of 1946, during his time as President of the Royal Academy, fulfilling an ambition to tackle this challenging subject. Long a well-known figure on the racing scene, Munnings was allowed privileged access to the side of any racetrack that he cared to choose, to make the rapid sketches essential to his working method. The aftermath of a race presented greater logistical problems, as unlike Starts, the riders quickly dispersed. He wrote in the third volume of his autobiography: ‘After the race! That should be my picture! As the field sweeps by the winning-post I am already hurrying to the scene, which is over all too quickly … A winter afternoon with bright sun; – I love the winter sunlight – many horses are returning after a steeplechase. With extended nostrils and quivering tails, they come to a stand; the jockeys, dropping their reins, dismount and unsaddle, and all too soon the steaming horses are led away and the scene is ended’. The vitality of this painting carries a sense of the energy and triumph expended in the just-won race, although the lead horse stretches out his neck in fatigue and relief, and the jockeys ride with bodies relaxed and reins slack. Rich impasto, a frieze of colours in the jockeys’ silks and the glossy flanks of their mounts, and a sky of scudding clouds, evoke the exhilaration of the racecourse for both participants and spectator. Born in Mendham, Suffolk, Alfred Munnings was the son of a miller. He was apprenticed to a firm of lithographers from 1893 to 1898 and studied at the Norwich School of Art and in Paris. There he was impressed with plein-air naturalism; this, together with his introduction to the racecourse in 1899, influenced the themes for which he became famous. While in Mendham, Munnings painted many scenes of country life, particularly horse fairs. He went to Cornwall in 1908, and for many years was an important addition to the Newlyn School of artists. When the First World War broke out, Munnings enlisted, despite having the use of only one eye owing to an accident in 1899. He became an army horse trainer near Reading and later went to France as an official war artist, attached to the Canadian Cavalry Brigade. The year 1919 was a major turning-point in all aspects of Munnings’s life; he painted his first racehorse, Pothlyn, the winner of the Grand National, and became an Associate of the Royal Academy. He met Violet McBride, whom he was to marry, and bought Castle House, Dedham, where the Munnings Memorial Trust maintains a permanent exhibition of his pictures. Munnings’s prolific career, spanning over 60 years, brought him honour, with election to the Presidency of the Royal Academy in 1944, a Knighthood in 1945, and a personal award from the Sovereign in 1947, when he was created Knight of the Royal Victorian Order. The Finish, London 1952, p.284.